Hello you! 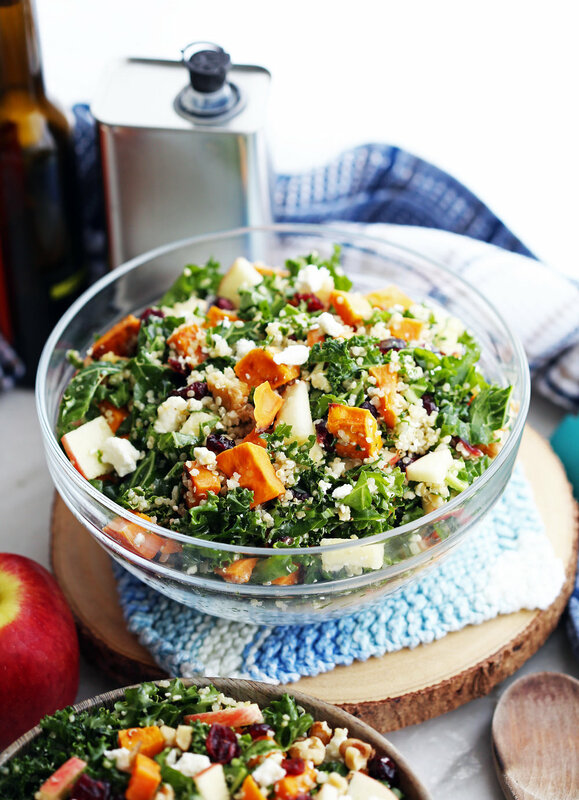 Today’s recipe is a healthy and hearty vegetarian salad that’s amazing as a side dish, but can also be a light meal as well. This pretty salad is full of flavour and textures from salty to sweet and crunchy to creamy. The day that I shot photographs for this salad, I also made amazingly tender baby back ribs made in the Instant Pot that were paired with a sweet and spicy homemade cherry chipotle sauce. Even if you don’t have an Instant Pot, you need to check out the simple stovetop recipe for that sauce. It’s a great sauce and dip for ribs, chicken wings, or even mixed into pulled pork. If you head over to the pork ribs recipe blog post (my post just before this one), you’ll see this salad in the background of a couple photos. Place peeled and chopped sweet potatoes on a parchment-lined baking sheet. Complete recipe ingredients and instructions in the recipe card down below. Roast at 400 degrees F for 25 minutes, flipping once. As the sweet potato roasts, cook the quinoa according to package directions. Chop the kale into small pieces and massage the kale with olive oil and salt. Assemble all the ingredients into a large bowl and toss with the vinaigrette. Enjoy! What’s in this delicious salad recipe? 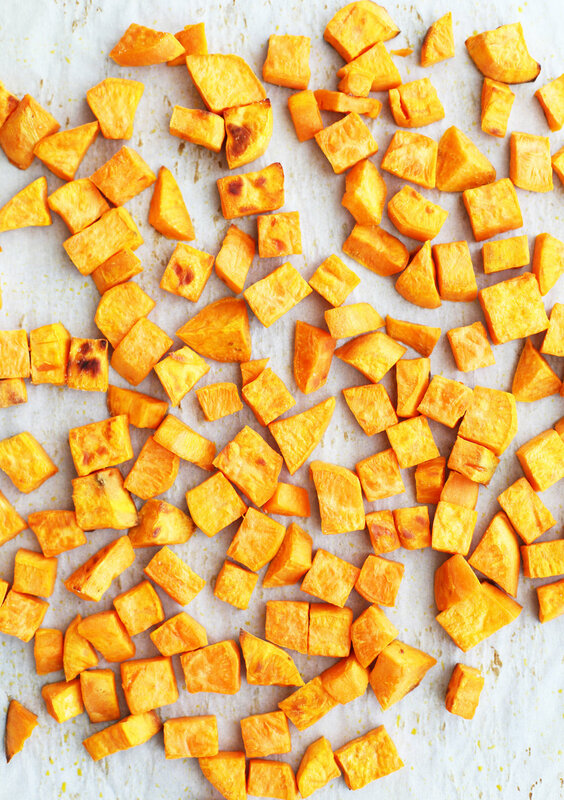 Sweet Potatoes: Bite-sized oven-roasted sweet potatoes are naturally sweet, tender, and nutritious. They are an excellent source of vitamin A, and are high in vitamin C, potassium, and manganese. Leafy Green Kale: I used curly kale for this recipe (as well as so many other recipes). Known for having green crinkly, crunchy leaves, it has a slight bitter and earthy flavour. TIP: Don’t skip the step to massage the small chopped kale leaves with oil and salt for several minutes with your hands. This will make the kale more tender and easier to eat. 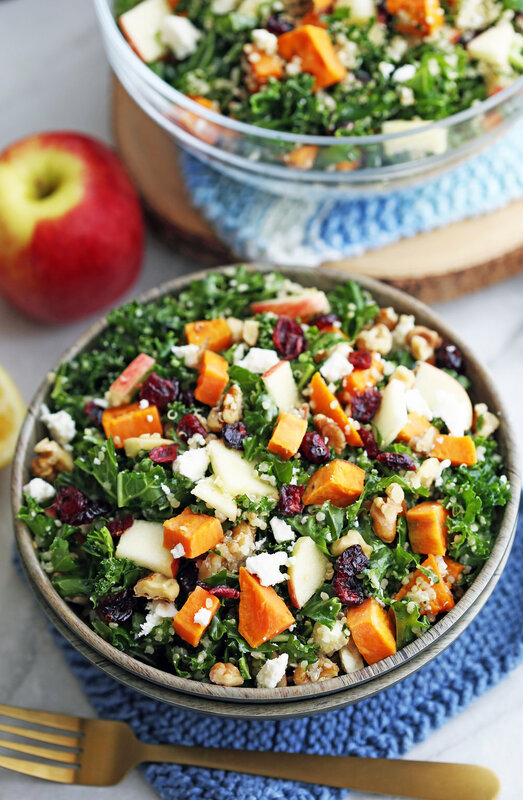 How to Choose Sweet Potatoes and Kale? When choosing sweet potatoes, pick the ones that are firm, unwrinkled (smooth), and free from cracks, bruises, and blemishes. Dark orange-fleshed sweet potatoes (I used these for this recipe) are also more sweeter and tender than their yellow and purple counterparts. How to pick kale? Look for crisp, small-leaved green kale (they are usually a little more tender and milder in flavour than bigger leaves) and avoid ones with wilted leaves, yellowing leaves, and/or blemishes. Quinoa: This seed (yep, it’s not a seed, not a grain) has a nutty flavour and slightly fluffy, lightly chewy texture when cooked. It’s also wonderfully good-for-you being loaded with healthy nutrients. For example, it’s high in protein, fiber, iron, and potassium. 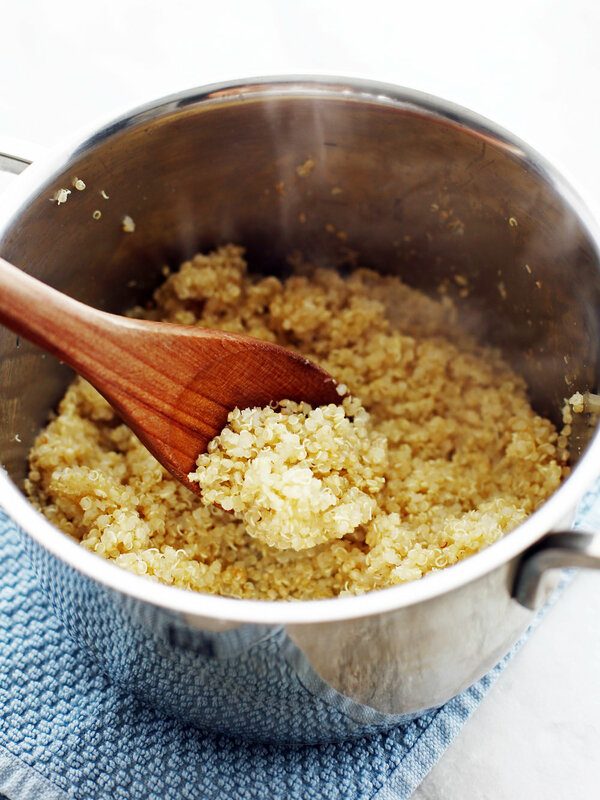 Another TIP: Remember to rinse uncooked quinoa under cold water before cooking it. It will remove saponins, a compound that coats the quinoa, that can give the quinoa a bitter taste when cooked. Additional natural sweetness with fresh apple slices and dried cranberries. I used ambrosia apples this time, but any sweet apple like Galas or Red Delicious would be fabulous as well. It’s an easy add-in that’s sweet, crisp, and healthy! Dried cranberries (look for no added sugar ones) are chewy, sweet and tart. Then there’s the crunchy, sweet, and nutty walnuts, which is a good source of fatty acids, omega-3s, and heart-healthy fats along with healthy antioxidants. 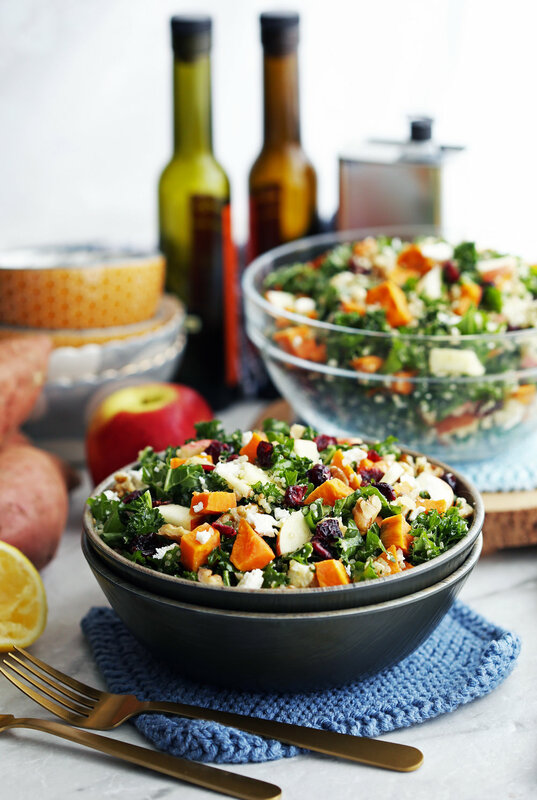 Crumbled, creamy feta cheese is key to this recipe as it provides a salty and tangy flavour in contrast to the sweet ingredients in this sweet potato salad. Everything is tied together with a simple three-ingredient vinaigrette, which is a blend of olive oil, apple cider vinegar, and lemon juice. 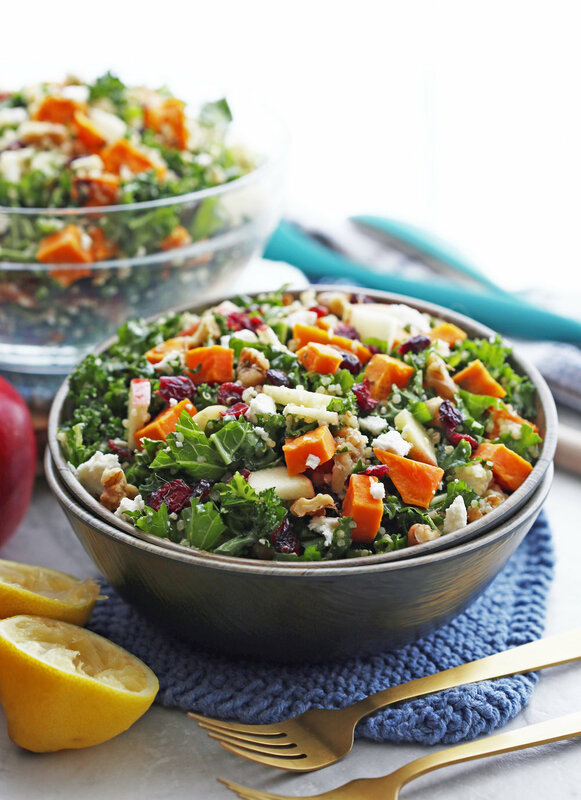 The sweet and zesty flavours in this dressing wonderfully compliment everything in this salad. For the salad. Preheat the oven to 400 degrees F. On a large baking sheet lined with parchment paper, toss together the sweet potatoes with one tablespoon of olive oil and salt to taste. Spread the sweet potatoes into a single layer and roast for 15 minutes before stirring and flipping. Roast for another 10 minutes, until tender and lightly browned. As the sweet potatoes roast, prepare the quinoa according to package directions. Set aside. 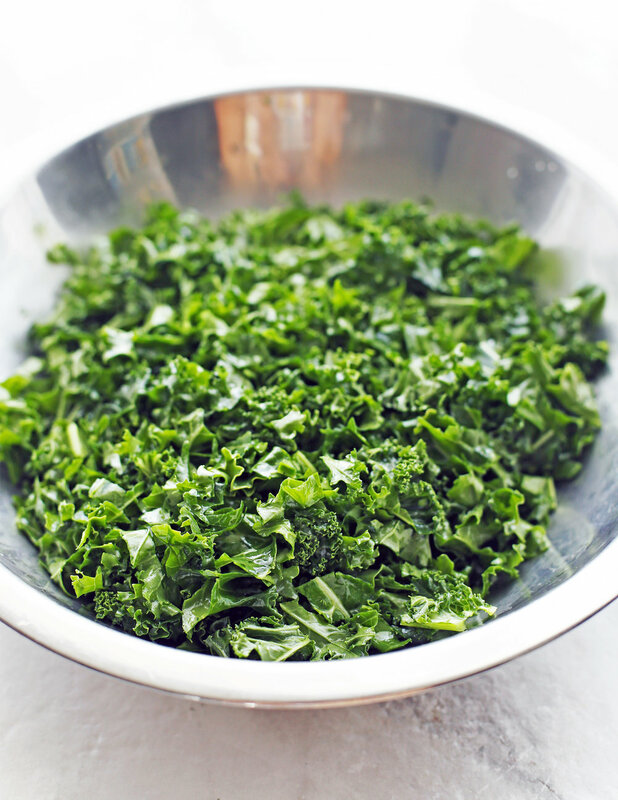 Place the chopped kale in a large bowl with one tablespoon of olive oil and a pinch of salt. Using your hands, massage the kale, making sure to coat each piece of kale with oil, about 2-3 minutes. Set aside. 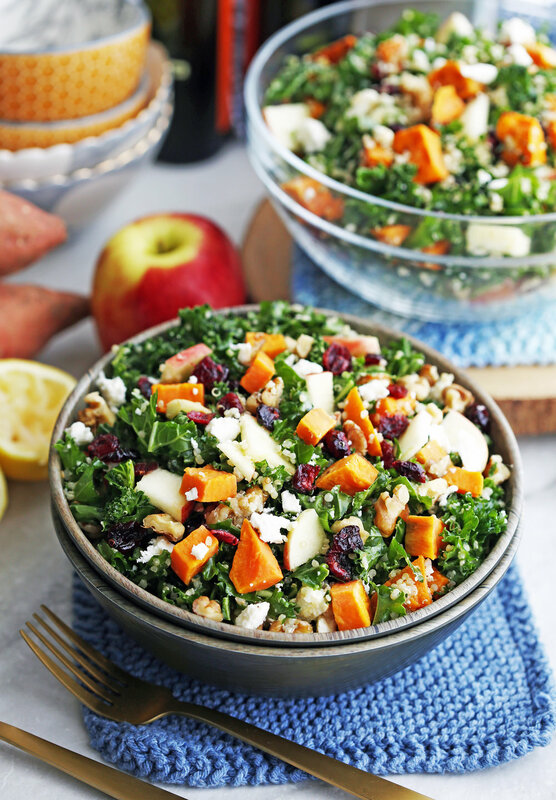 After the sweet potatoes are ready, place them in the large bowl with the kale. Add the remaining salad ingredients. For the vinaigrette. Combine the vinaigrette ingredients together by whisking in a small bowl or placing the ingredients in a mason jar tightly sealed with the lid and then shaking until well combined. Put it together. Top the salad with the vinaigrette and toss well to combine. Best served immediately. *½ cup dry uncooked quinoa yields about 1½ cup cooked quinoa. If you are planning to have leftovers, cover the salad with plastic wrap or keep in a sealed container in the refrigerator for up to 3 days. Nutritional information represents one serving for a total of eight servings.